Having grown up in the Midwest and being of German and Dutch descent, I LOVE all things bread. Unfortunately most types of commercially available baked goodies can leave me with excess phlegm build up – a biofeedback signal from my body that some ingredient is not quite jiving with my physiology. So for the most part, Alex and I avoid consuming commercially produced bread and pasta. But from time to time, I just have to whip up a batch of these lovely milk kefir pancakes to feed the carbo-craving beast that lurks in my DNA! **UPDATE** We now have an amazing gluten-free version of the recipe available for anyone looking to further reduce the impact of commercially grown wheat (a glyphosate heavy crop here in the US) on their body. The recipe is identical except for using a gluten-free flour blend. We use Trader Joe’s brand as the combination serves as an excellent 1:1 replacement of traditional wheat flour. “Oladi” (Оладьи), as they are known to Russians, are nearly identical to buttermilk pancakes except with milk kefir. These days its easier for most people to whip up freshly fermented milk kefir than it is to find authentic buttermilk. While seemingly convenient, the store bought cartons often contain unnecessary ingredients and honestly, by the time I want the pancakes, I’ve already forgotten to buy the buttermilk and the kefir is right here in the cupboard! True confession: I’m a bit of a lazy cook and an even lazier baker; so to execute any recipe I have to a) really love it and b) it has to be easy. Thankfully, this recipe is both. So while buttermilk may not be lurking in most fridges, if you are fermenting milk kefir, it can serve as a bacteria & yeast rich substitute with spectacular results. Especially if it’s a little old and perhaps not as palatable to drink, the healthy acids and tangy flavor give rise to a batter that yields fluffy “light as air” pancakes FROM SCRATCH in only 30 minutes! Soooooo – I went to research this question thinking I had a simple answer and just needed some additional resources but when I scratched the surface, I found all kinds of contradictory information regarding whole grains, phytic acid and phytase. When that happens, I just have to refer back to our “Trust YOUR gut” philosophy. For me, when I eat these pancakes, I don’t get the typical phlegmy biofeedback that I get when I consume commercially prepared grain products. Is that due to the fermentation? Is it due to the lack of other commercially added preservatives or ingredients? I honestly don’t know for sure. What I do know is that these milk kefir pancakes taste great and I don’t feel crappy after eating them. Let us know your biofeedback in the comments below! 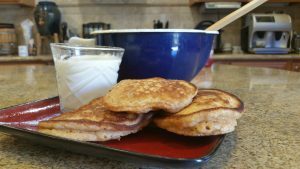 The bacteria and yeast in the kefir feed on the flour and sugar while the batter is resting and create air pockets leading to light, fluffy pancakes that melt in your mouth. The tangier the milk kefir, the more savory and sour the pancake – ideal for serving with sweet fruit or maple syrup. Add flour, sugar, baking powder, cinnamon, baking soda and salt to a large bowl. Stir or sift to combine evenly. Pour in milk kefir and stir into a semi lumpy but evenly mixed batter. Cover the bowl with a towel and set aside in a warm location for a minimum of 30 minutes up to overnight. Gently stir in the egg and vanilla mixing only until combined. 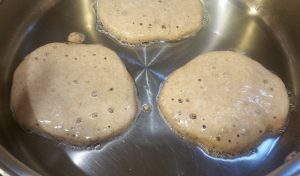 Heat a well oiled pan (we use ghee*) until drops of water sizzle on the surface. With a ¼ cup measure as a scoop, pour batter into pan. 2-3 pancakes may fit in the pan depending on size. CO2 manifests as air bubbles giving the pancakes a nice rise. When bubbles dot the surface of the cake, use a spatula to flip it over. The more you make, the more quickly the bottom may brown due to the butter. Add more ghee to the pan between batches as needed to prevent pancakes from sticking. Place pancakes in a warm oven (200F) and slather with butter until all are ready. strawberry jam and yogurt or creme fraiche! To keep the cakes extra fluffy, pour the batter into the measuring cup rather than scooping them out which can break some of the delicate air bubbles. Kefir pancakes on the left were poured into the measuring cup. The ones on the right were scooped. Ghee is clarified butter. It greases the pan easily but without the burning mess that usually occurs from the protein solids in butter. 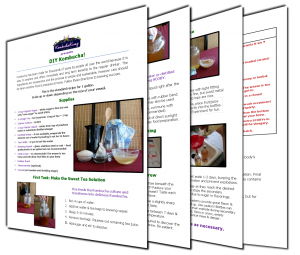 Check out our fantastic Kombucha sourdough recipe. It is a bit denser since our yeast is different but it yields a rich flavor. Thanks again for your useful website and information you provide to your readers!